Fed | Learning to feed those I love the way my grandmother fed us. Eat something! 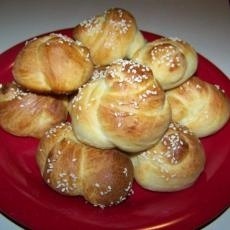 At some point this weekend, I am going to attempt to make choreg, an Armenian sweet bread often made at Easter time. This bread is perfect for people who speak this insanity: “I don’t really care much for sweets.” Choreg is an ideal breakfast food as it is complimented perfectly by coffee and can easily be eaten on the go. Perhaps the most interesting thing about choreg is that it involves an exotic spice never found in a Vons or Trader Joe’s. Mahleb must be tracked down at a Middle Eastern Market, and even finding it there can be challenging as I had to ask someone at Super King for help. 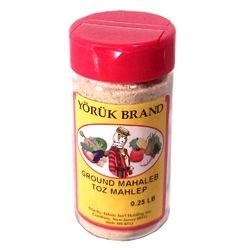 For anyome in a rural or Middle America location where there may not be a Mid East market, online might be the best bet for acquiring the mahleb. 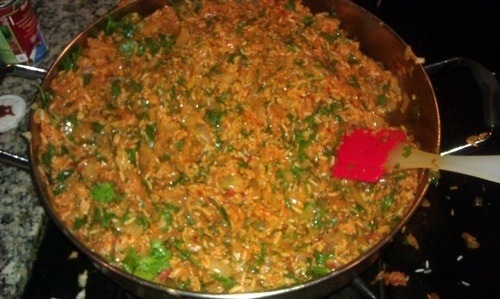 The scent of mahleb can give a person a substantial clue into the flavor of choreg. 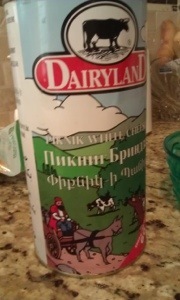 It tastes as it smells and that is a very pleasant thing. Mahleb’s scent is something of a nutty vanilla aroma. The appeal is immediate and unlike with dolma, I don’t think this appeal is debatable. The reason I say that I will bake choreg at “some point” is because like many recipes, I am learning, this bread requires time. The initial rising time is 6-7 hours and then another hour of rising after the bread is formed and on that baking sheet. If you have any appointments or responsibilities in your day, choreg may be hard to squeeze on to the agenda. This is a busy weekend for my son and me with a day camp taking up from 8 am until 1 pm on both Saturday and Sunday, so my choreg expedition may need to wait until Sunday night. My aunt recommends making the dough at around 11 pm the night before and then finishing the baking process in the morning, after the dough has risen overnight. Plan on finding me back here on Sunday and Monday, sharing with you the ups and downs of choreg baking. In the meantime, find yourself some mahleb, inhale, and enjoy. 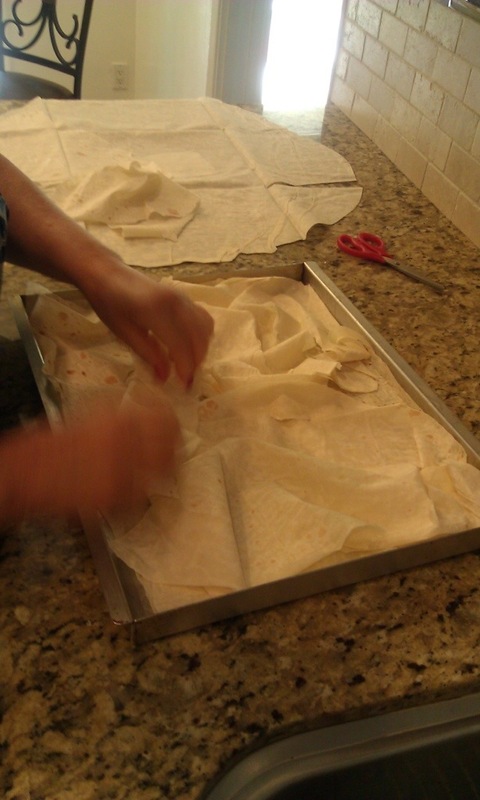 Last Friday, I made my second trip out to visit my aunt and get schooled in the art of Armenian cooking. 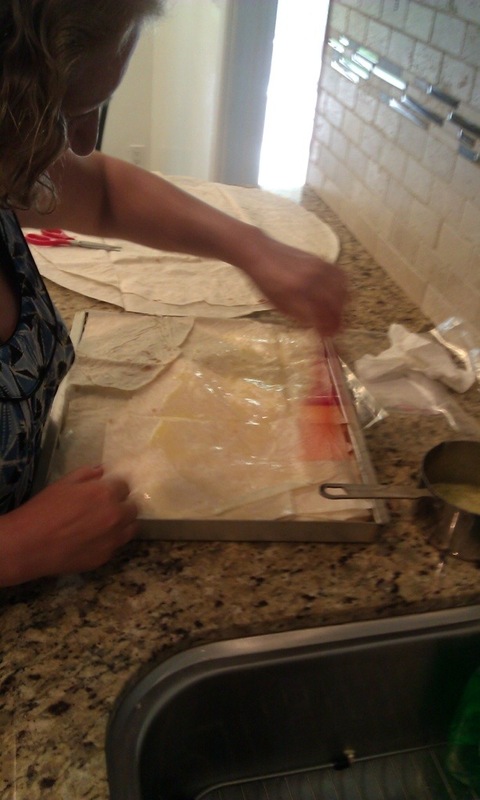 She was going to her sister’s house later that night and wanted to take cheese boreg, or rather a version of it called sous boreg (pardon spelling here), so this would be my first lesson of the day. 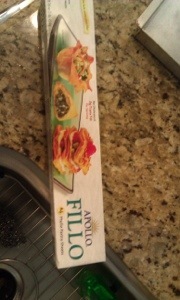 This rich appetizer was on my short list of recipes to learn anyhow. My uncle chimed in on the subject of cheese boreg. “It’s too rich if you eat it before the meal. It’s like someone offering you pizza before dinner.” Indeed. Place first two-three layers of fillo dough nicely on the bottom and on the top. 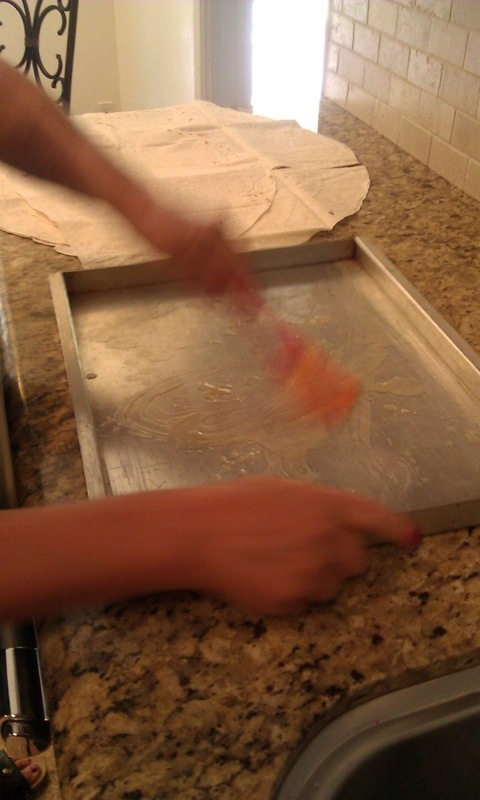 In the middle, scrunch the dough to make it fluffy. 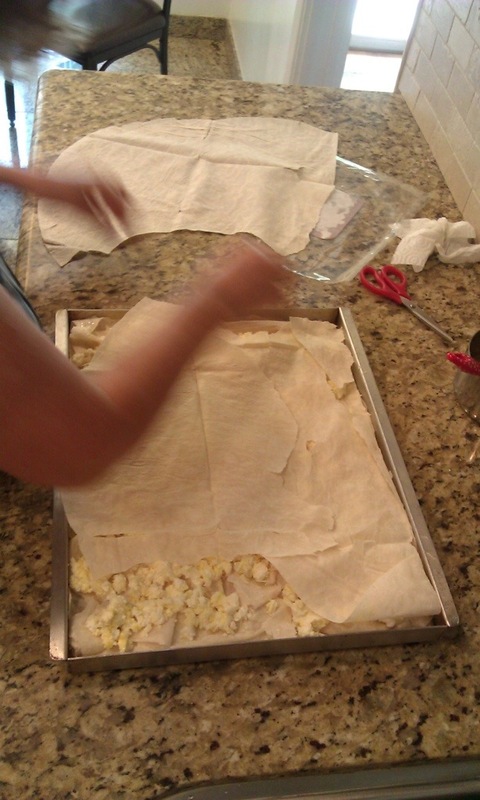 6-7 fillo sheets for the scrunch layer. 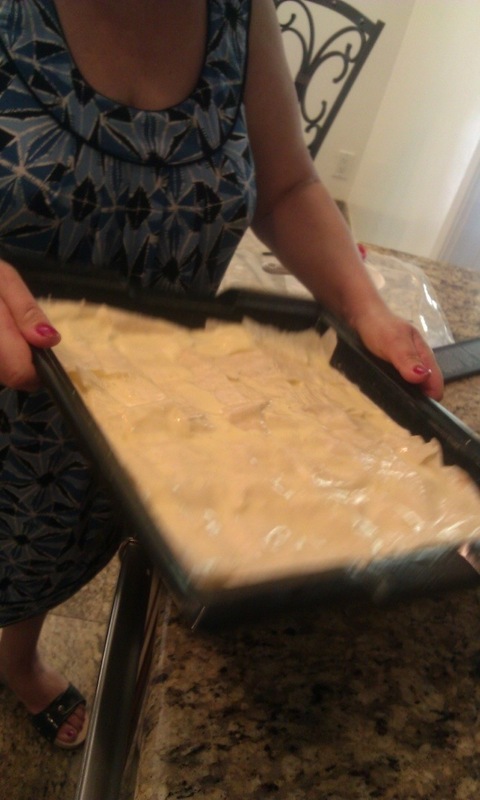 Add the cheese/egg filling. Place 3 layers of fillo on top, smooth. 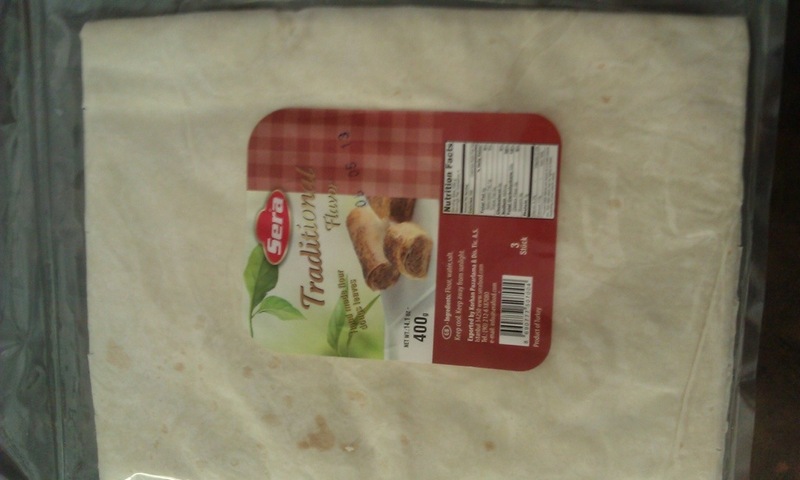 For sou boreg (pictured below), use one layer at the bottom and top because the dough is thicker. 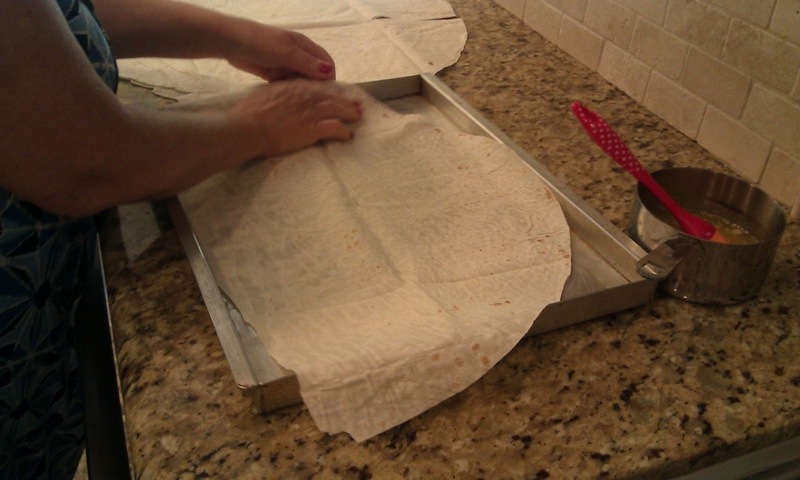 In the middle, for the “scrunch layer” use another two sheets. 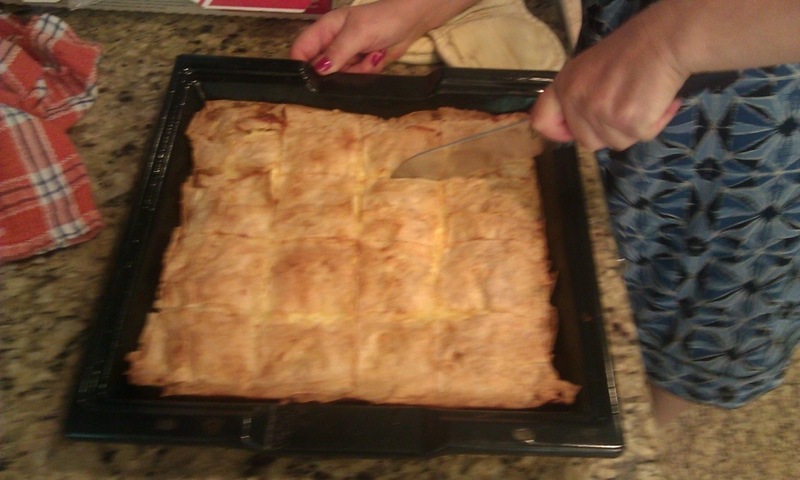 Drizzle butter over the layers and then brush with pastry brush. Can make one day ahead. Cut before cooking. Easier to cut if it has been refrigerated. Take the 4 eggs and beat them. Add the milk and beat again. After cutting the boreg, pour the egg and milk mixture over the whole thing and tilt the pan around to make sure the liquid is well distributed. Cook at 350 for about an hour. First things first, leaves soaking. Auntie Rosa says to use fresh leaves if you have them. 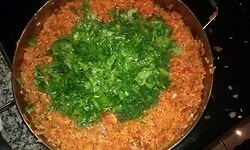 If not, your are left with the jarred grape leaves and they must take an hour-long bath with water changed frequently. 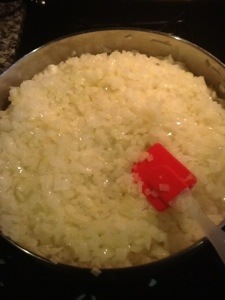 Onions chopped. 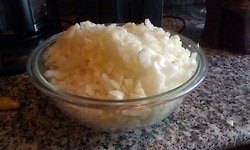 I must not have ever chopped eight onions before because otherwise I would have known to use it as a method of torture. I didn’t think I was going to make it. At the end, I looked like this. You know the owl who philosophically poses the question of how many licks does it take to get to the center of a Tootsie Pop? Well, I wish I had thought to ponder how many minutes does it take to fry eight onions before I actually began to do so. 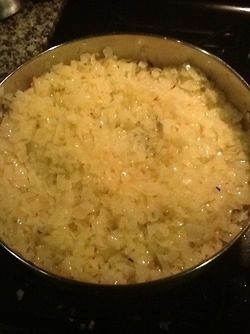 I was expecting a few minutes because I have only cooked one or two onions at a time. So time was passing… passing… and I thought I had already screwed it up and I was only at step one. I was ready to 911 call my aunt, but I decided to turn up the heat from medium to medium-high and about 20 minutes later, my onions finally had a tan. I showed my aunt these pictures and she said that my onions needed more cooking. 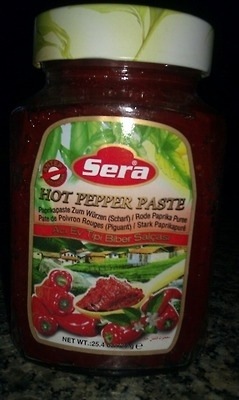 In addition to the tomato paste and crushed tomatoes, my aunt recommends this pepper paste. It says hot, but apparently Middle Easterners use some other measurement for heat than Mexicans. This paste is mild and flavorful, but not very spicy. I love fresh herbs. The aroma of the dill, parsley, and cilantro together was heavenly. I opted for Italian parsley only because it looks prettier than American parsley. My aesthetic bias is justified in the kitchen. When I finished with the dolma. I could tell that they were under seasoned. My aunt agreed, but said, “Way, way too under seasoned.” So please be liberal with salt, pepper, and paprika. You can see the amount of herbs I used. Go green. Use more herbs. 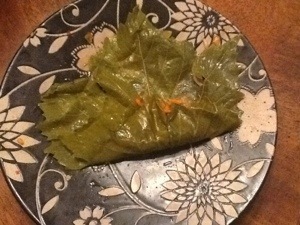 The picture shows one of my more anorexic dolmas. I tried to fill most of them generously, but not excessively. A bulging dolma is a messy dolma. Too much filling and it will start oozing out or bust through the delicate grape leaf. My aunt and uncle both remarked on my excellent dolma rolling technique. Perhaps there was some activity in high school which may have helped me with this. Heh. Heh. The similarity in appearance to cigars is unfortunate. I think the appearance if off putting to many people. I can promise anyone who has not tasted it that it does not taste a thing like something you are meant to smoke. 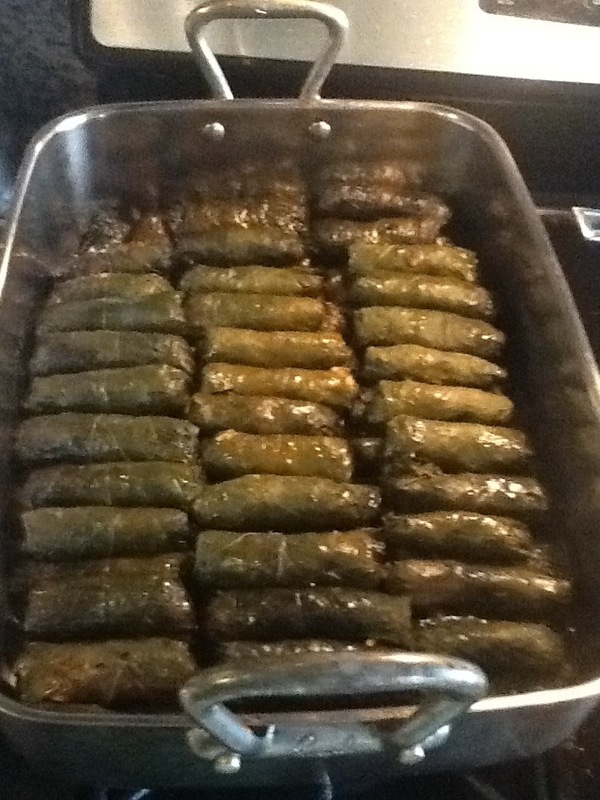 I rolled a crap load of dolmas. During the process, I watched Real Time with Bill Maher, True Blood, and Friends. This is a dish I would recommend making with a partner, minion, or slave/man servant. I started the process around 7:30 pm. By the time they were cooked and out of the oven, it was 1 am. Egads. If using leaves from a jar, soak the leaves in water for an hour, changing the water several times. Drain and cut off stems. If using fresh leaves, boil very briefly in water with salt and oil. Rice should only be partially cooked. Turn off. The back part of the leaf goes on inside of the roll. Place dolma in a roasting pan. This amount should be for two layers. 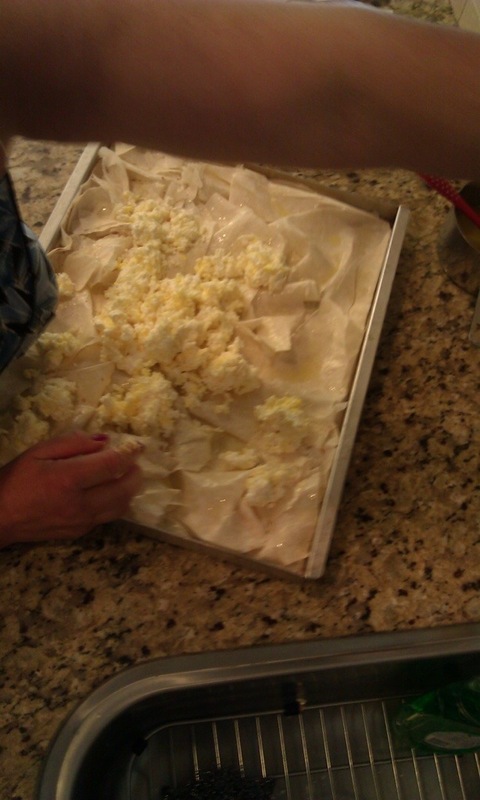 Mix water and oil and pour over, but not enough to cover the dolma completely. 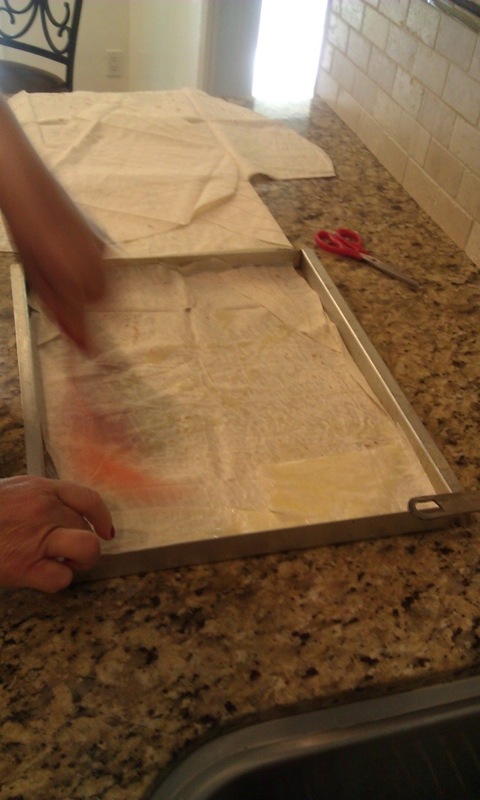 Cover tightly with foil, pressed against the dolma, then put another sheet of foil over whole pan. Grandma used plates on the first sheet of foil, not second sheet. Cook at 350 for about an hour. Check it. Leaf and rice now need to be tender. If making five cups of rice, add 20-30 minutes to cook time. Dolma is one of many dishes I refused to eat as a child. I was picky and often relied on grated cheese, steak, or peanut butter to get me through a meal away from home. 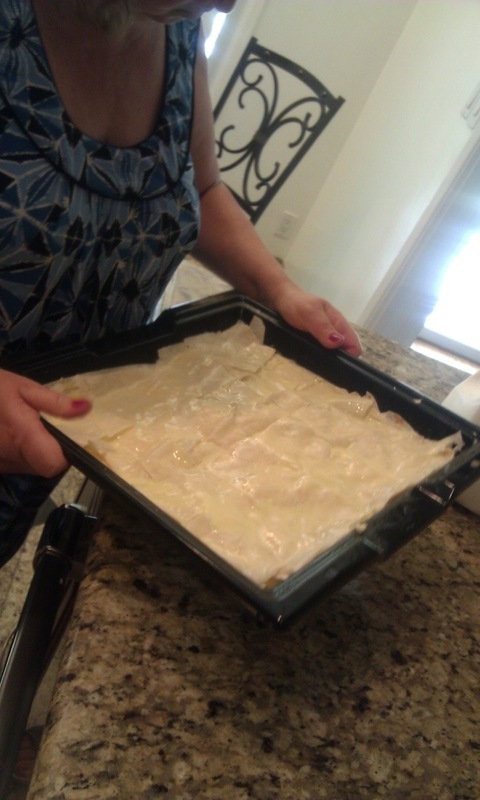 Growing up bicultural, the food of my mom’s Armenian family scared me. The only thing which repulsed me more than dolma was hummus. Whereas dolma looked like greasy green cigars, hummus looked simply like vomit. 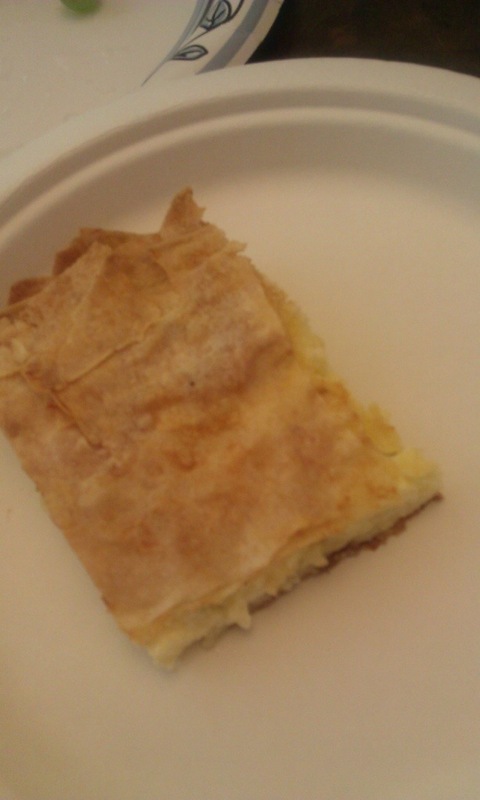 I think I survived on a staple of string cheese and pita bread for most family gatherings. And then I hit puberty and either my taste buds matured along with my other parts, or I was too hungry not to give these exotic foods a chance. I was probably 11 or 12 when my culinary world expanded in something of a Big Bang food explosion. Once I was willing to actually try these foods, I realized that I should thank my lucky stars for being half Armenian and for having a grandmother and aunt who could cook and bake circles around anyone. 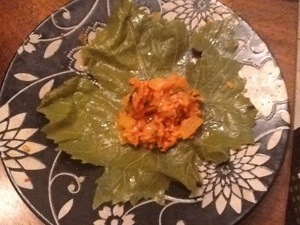 Dolma, stuffed grape leaves, became one of my very favorites. When I first started eating them, I would make what I call an “Armenian Taco” which was a half a slice of pita bread smothered with hummus and topped with a dolma. I would fold it on the sides and eat it like the Mexican standard fare. 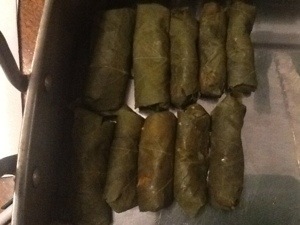 During high school I remember bringing leftover dolma home from a family party. My friend Ryan was over and I convinced him to try one. He ran to the sink and spit it out. Shameful. Had his taste buds not matured like mine? Or had his super white/non-ethnic genes disabled him from appreciating such flavors? Since I will see him in a few weeks at our 20 year high school reunion, I will ask him how Middle Eastern food is treating him these days. I happen to know he has traveled to Turkey and I think they imprison you there for food rejection. I also have a fond memory of coming home for Christmas from my first semester away at college in Oregon and my aunt and grandma asking me what they could make to take back with me to school. I asked for dolma. The little Tupperware container sat in my mini fridge and I could take out a piece of home whenever I needed.